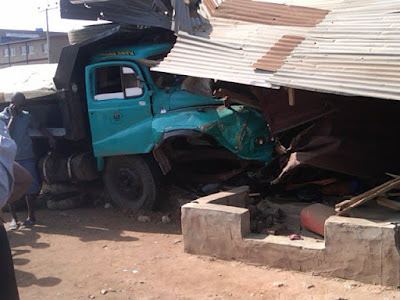 No fewer than four people reportedly lost their lives on Saturday at Moniya-Iseyin road, in Ibadan the Oyo State capital when a truck conveying sharp sand lost control. It was also gathered that about ten persons also suffered various degrees of injuries while five motorcycles and three tricycles were destroyed beyond repair. Those who lost their lives in the accident include; a motorcycle operator, a woman, an toddler boy and a trader at the Moniya Butcher market, Ibadan. But, the driver of the tipper was said to have escaped from the scene of the incident unhurt. Eyewitnesses around the scene of the incident informed journalists that the casualty figure would have been higher if not for a member of the transport union unit at the Moniya garage, who saw the haphazard manner with which the truck was descending the hilly road and immediately alerted people to scramble to safety. According to them, the tipper driver was seen struggling to gain control of the truck which was suspected to have left a tipper garage within the Moniya axis with the load of sand, but the bad situation of the road did not help matters. Chairman, National Union of Road Transport Workers, (Motorcycle), Moniya Garage Unit, Mr. Idris Oladoja while confirming the incident described it as a sad development that could have been averted. Officers from the Nigeria Police Force from Moniya Divisional Headquarters and Ojoo were seen at the scene maintaining traffic flow. But, Police Public Relations Officer of the state Police Command Adekunle Ajisebutu said two people were confirmed dead. He said that their corpses have been deposited at the State Hospital, Mortuary, Ringroad, Ibadan for autopsy. He however added that the driver of the tipper has been arrested and the accident vehicle recovered to the station for VIO inspection.